The Roadie was conceived to comply with the TSA's 2013 plan to allow qualified knives on planes. 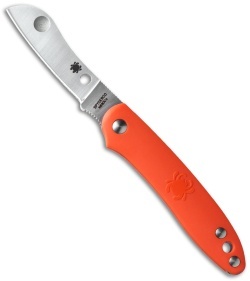 Although the plan was withdrawn by the TSA, Spyderco is ready for the day when knives and planes can coexist. Spyderco's Roadie is essentially an evolved version of a penknife for the modern man. 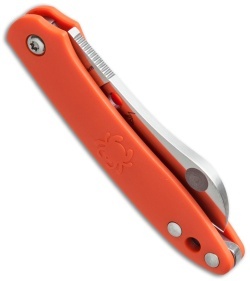 It has a practical sheepsfoot style blade with a trademarked Double Dent opener for fingernail-free two-handed opening. The orange handle is contoured fiberglass-reinforced nylon with a notched-joint mechanism. An index-finger choil on the blade aids to prevent accidental closure and facilitates precision cuts. Available in a handful of different colors, the Spyderco Roadie is a friendly, high-utility knife for the modern age! 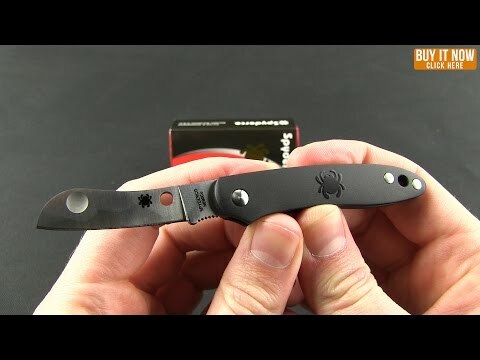 This knife is perfect for us Spydie junkies. It sits right next to my chapstick everyday in my pocket. Makes a perfect second blade for when you just don't need to whip out the Paramilitary 2. Super sharp and super useful. Must have. I bought this knife with the intention to carry it as back up knife for when I'm in the office and don't feel like pulling out one of my more intimidating knives. Its been working great! Great little knife to have in your pocket, I forget its there half the time. The materials they use are good! Im a really big fan up the circular thumb opener, it makes it much easier to open than your average nail nik. They seem to have a variety of colors too which is a plus! This one is perfect to throw in your pocket and forget it's there til you need it. Great size and design.